Have you ever tried socca? It’s a new-to-us bread that’s not only vegan and gluten-free, but also grain-free, as it’s made with chickpea flour! And in this Indian-inspired version, we used whole spices to infuse a curry flavor into the bread. Swoon. How do you enjoy socca? So many ways! This recipe in particular works well anywhere traditional naan would, as well as with dips such as hummus and baba ganoush. But you can also use it as a pizza base (just adjust the spices as desired)! We haven’t tried socca as pizza crust yet but suspect that it would make a delightful breadstick (recipe likely coming soon). In the meantime, let us show you how easy it is to make this fluffy, flavorful bread! This 7-ingredient recipe starts with garbanzo bean flour, salt, baking powder for a little rise, and warm water. This creates the base we add the delicious spices to. For spices, we were inspired by Amy Chaplin’s recipe in At Home in the Whole Foods Kitchen (one of our absolute favorite cookbooks). 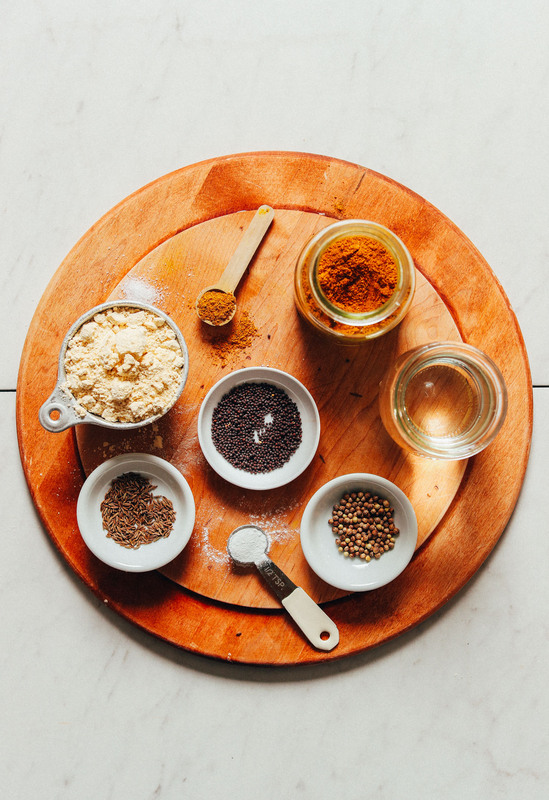 Whole cumin, coriander, and mustard seed blend well with our homemade curry powder for the ultimate dreamy curry flavor. Once the batter has rested for 30 minutes – 1 hour, it’s time to cook. 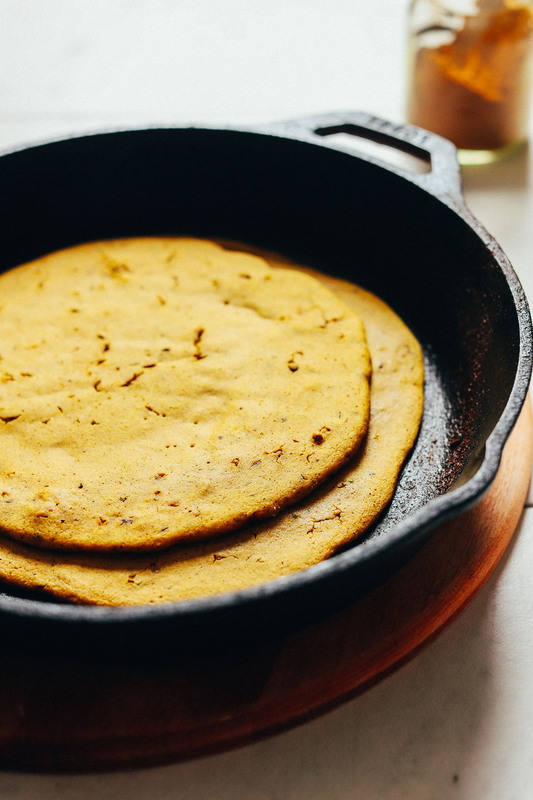 Socca is usually poured into a hot skillet to get brown on the edges and the underside. Then it’s transferred to the oven to get fluffy and cooked through. The whole process takes about 15 minutes. Easy peasy. Repeat until all of your batter is used up and you have mounds of fluffy socca on your hands. 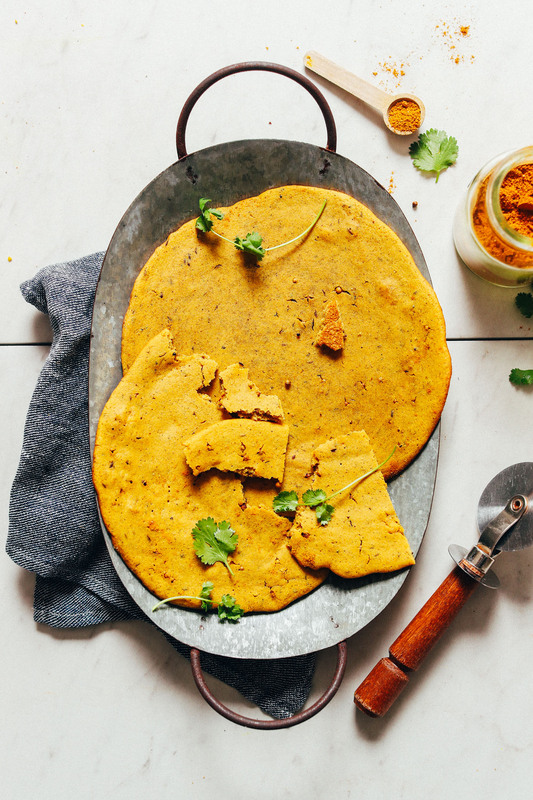 This would make the perfect snack on its own or bread in place of naan or pita when you need a grain- or gluten-free option. Pair with dips like our Golden Goddess Hummus or saucy entrées like Kitchari. As we mentioned above, socca can also be made into pizza – a concept that’s on our testing list! Stay tuned. If you’re into bread (I mean, who isn’t? 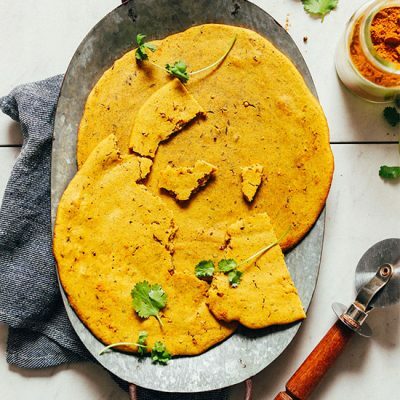 ), also check out our Easy Vegan Naan, Garlic & Herb Flatbread, Fluffy Spelt Dinner Rolls, Easy Vegan Dinner Rolls, and Seeded Whole Grain Bread. 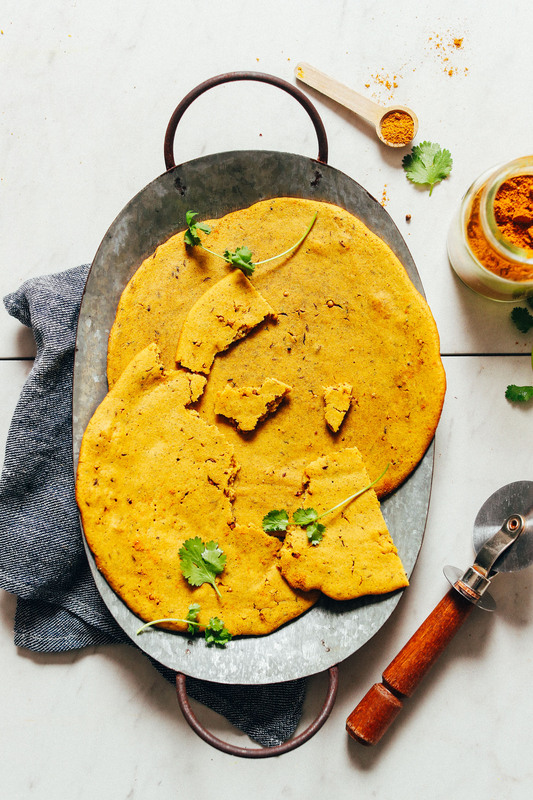 Vegan and grain-free socca seasoned with curry spices and baked until fluffy and golden brown. Just 7 ingredients and simple methods required for this wholesome side or snack! To a medium mixing bowl, add garbanzo bean flour, sea salt, and baking powder and whisk to combine. Slowly pour warm water into dry ingredients and whisk until smooth. Heat an oven-safe cast-iron or metal skillet (we prefer cast-iron) over low-medium heat. Add avocado oil, curry powder, cumin seed, coriander seed, and mustard seed (optional) and allow to toast until just fragrant (~2-3 minutes), stirring occasionally. Add spice mixture to chickpea batter, stir to combine, and then cover with plastic wrap or a towel and allow to rest on the counter for 1 hour (or at least 30 minutes). Once the socca has rested, preheat oven to 425 degrees F (218 C). Also heat the oven-safe cast-iron or metal skillet from earlier over medium-high heat (it should still have a little oil from cooking the spices earlier, which is great for preventing sticking). Once hot, add enough chickpea batter that, when you swirl it around the pan, the batter spreads into a large, thin pancake that reaches the edges of the pan. Carefully transfer the hot skillet to the oven and bake for 10-15 minutes or until bubbles have formed, the edges have browned, and the top is slightly golden brown. Remove from oven after baking and let cool in the pan for a few minutes. Then gently loosen with a spatula and slice on a cutting board (or slice right in the pan). Repeat cooking process with the remaining batter (our cast-iron skillet is 10 inches in size and yields two large pieces of socca as the recipe is written). Serve as is or with anything you'd enjoy with naan. Or eat this with dips such as hummus or baba ganoush. Best served fresh. Leftovers will keep at room temperature for 3 days or in the freezer for up to 1 month. Enjoy at room temperature or reheat on stovetop until warm. *As recipe is written, yields 2 large round pieces of socca bread. *If subbing water for oil, make sure to use a non-stick pan. Made this last night, and leftovers were used tonight to mop up lentil and carrot soup. Absolutely delicious, and works wonderfully even in my terrible student oven! I substituted avocado oil for olive, used the ground spices, and also added a 1/4 tsp ground turmeric. Simply delicious. I make this all the time – LOVE it! To simplify, I put the curry/spices right in with the batter and heat up some butter in the pan. This is so yummy! I Am trying not to eat it all in one sitting. I ate this so fast! This was easy and unbelievable tasty. The aromatics and the warmth makes this comfort food! Woo hoo! Thanks for sharing, Eva! Could I put in a recipe request please? I was watching on ‘Diners, Drive ins and Dives’ a dish that featured coconut ‘titiyas’ – a flatbread eaten in Guam. Sounds delish but I can’t find any vegan friendly recipes. I wonder if you could work your magic?! This looks absolutely marvelous! I love the Indian-style flatbreads, but I do not think I have ever tried socca before. I’m curious to see how it would taste. Obviously, your take on it probably tastes perfect! We hope you love it, Cassie! Just made this recipe and it tastes great! Made it in a 14 inch iron skillet using all the batter at once. Cut it into pieces in the pan, it would have been hard to get out otherwise, it stuck just a bit. I will make this again! Thanks for the recipe! Yay! We are glad you enjoyed it, Betsy! I made this tonight following direction and ingredients exactly, with the exception of the cast iron pan, which I did not have, and turned out so so yummy!! Thank you! Paired it with your curry lentil potato soup, cranked the AC, and pretended it wasn’t 80 frickin degrees in September. It’s ok but not extraordinary. Hi Dana! I’m in Italy for a month and realized your two recent posts are so similar to a popular street food here in the Livorno/Pisa area. Its called by two names cinque e cinque and cecina con melanzane. So yummy. Components are bread, crispy chickpea cake, garlicy eggplant. Look it up. With the ability to make this posted recipe I think you will have no problem mastering this yummy street food. Just get the name right depending on what part of Italy you visit. Locals are VERY passionate about the name! Bon appetito! We’ll check it out! Thanks, Lauren! I am a little confused about the caloric content. Does each big socca contain 8 servings? Or is there 4 servings per socca? This recipe makes about 2 medium size pieces of socca with 8 slices total. The nutrition information is for 1 of 8 slices (about the size of a piece of pizza). This turned out perfect! Delish w hummus! Just diagnosed as celiac and cant tell you how much this cheered me up! I can’t wait to try different spices to mix with different sort of meals!! 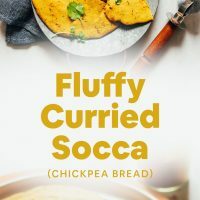 Oooh, I have a ton of chick-pea flour that I needed for a different recipe, and although I don’t often make breads, I must try this. Can’t wait. Thanks!! I made this last night to go with curried butter meatballs and rice. So delicious! The first batch I think I got a little too thin so they ended up more like a cracker. 2nd batch was perfect. Used my cast iron skillet and had no issues with them sticking. Thanks Dana! Glad to hear the second batch worked out well, Hannah! If I freeze this, what’s the best way to defrost/reheat? Thanks! Hi Claire! It will keep in the freezer for up to 1 month. Enjoy at room temperature or reheat on stovetop until warm. Hi Dana, thanks for the great recipe! I noticed in the nutrition info trans fat is listed as 4.3 g, which I’m sure (and I hope) is not the case ;) Can’t wait to try this socca with hummus as a vegan pizza! Thanks again as always for your tasty recipes. I’ll double check that – thanks! Whoop! We are glad you enjoyed it, Sam! But I do have a question re: nutrition, why is there 4.3g of trans fat? Also, is the “1 of 8″ serving size/info from a single socca (1/2 batter) from the 10” skillet cut into eighths? fixed! It was just a typo. I love socca! Thanks for posting this curry version; can’t wait to try it. I use socca as a pizza base all the time. I use the full batch of batter in a large cast iron pan. I broil it until it’s cooked, then add the toppings and bake until everything is hot/melty. So yummy! Tried this recipe this eve and I found the socca cooked properly when I did it stovetop with the oil, like traditional naan bread. When I tried to bake it in the oven it didn’t seem to cook through evenly. Could just be my oven (or my technique), but the cast iron pan stove top method worked well for me. The socca was delicious! Will definitely make it again. Yummy will try this! One question, I feel lazy about the oven step, do you think it could just cook in the skillet? Maybe flip it over…. That could work. Cook on higher heat at first, then flip and lower heat to finish cooking. 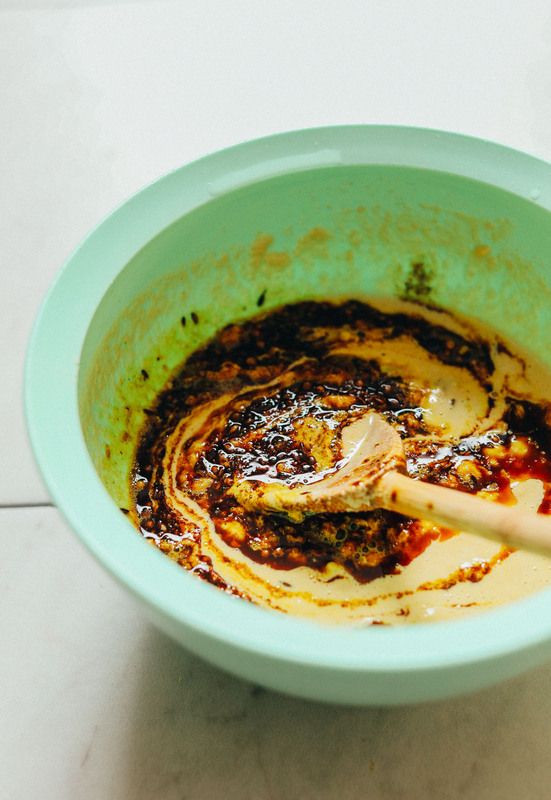 If using powders intead of the whole spices, could you just add them to the batter and skip the “cooking” step? I would still cook them a little. Being Indian, we make this all the time and call it instant dosa or cheela as it does not require fermentation. Only thing, I cannot stand whole or cracked coriander in anything, powdered coriander is fine. But whole cumin in this recipe is traditional and delicious. Ah! Thanks for the insight. I like the crunchiness of the whole seeds, but yes, ground can be used too! I haven’t made this recipe yet (will try it later this week), but socca is one of my favorite breakfasts to eat in lieu of eggs! It’s a great way to start the day with protein, and I often eat it with a side of breakfast potatoes. Agreed! Hope you like this version! Yum Pop! Anything with a side of potatoes works for me. I’d probably have it for lunch because I’m an idle old layabout and don’t get up in time for breakfast. Do you have a grain free baking powder you recommend or a substitution suggestion for baking soda? I think most contain corn starch. Hmm, I’ve never heard that. We used baking powder not soda. If that’s an issue for you just omit. For a baking powder substitute, I use 1 : 3 baking soda to cream of tartar. That works great for my daughter who can’t have corn starch. I have found it impossible to get the socca batter not to stick to the pan. I am using my regular tfal nonstick pan and usually don’t have problems like this! Has this happened to anyone else? Any idea where I’ve gone wrong/what to try? That always happens to me, I just accept that it needs quite a bit of oil or you can also use parchment paper. Hmm, so I’ve never had trouble with it sticking at all, but I’m working with a seasoned (and lightly oiled) cast iron skillet. I wouldn’t recommend stainless steel in this instance as it can be a little more prone to sticking. And a non stick shouldn’t stick regardless. Hope that helps! Any other oil should work, especially olive or coconut. Do you have another oil you recommend? I have to avoid avocados, but do not have an aversion to oil in general. In the south of France where this dish is very popular, they use olive oil. 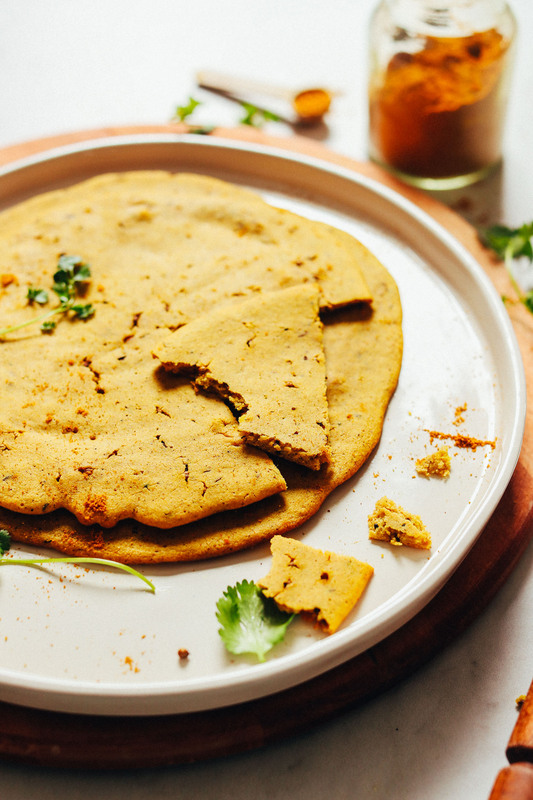 Socca is a popular snack food and is made like a pancake with chickpea flour, olive oil, a pinch of salt and sometimes herbs like rosemary. Algerian and Tunisian immigrants in Nice and Marseille sell it on the street as a snack. I make mine with herbs from my garden, and a good extra virgin olive oil. Chickpea flour can be hard to find but sometimes can be found in well stocked Italian delis. In a pinch, can be made thusly with whole dried chickpeas: In a dry blender jar add 2 cups dried chickpeas. Place the lid on the blender and hold it down. On a many speed blender, crank up the speed to grind and reocess until it becomes flour.